In his new book, Daniel Ellsberg does more than impart historical information and critique nuclear madness. He offers a full-throated call for ordinary citizens to act to avert the catastrophe. As someone who grew up during the coldest years of the Cold War, I have always been aware that we are living on borrowed time. During the 1950s, nuclear bomb tests were broadcast live on TV. And I recall being traumatized by the 1959 film, “On the Beach,” which depicts the dystopian aftermath of nuclear war. But the school air raid drills represented the most common reminders of the nuclear specter. When the siren sounded, we were expected to march out of our classrooms into the hallway, then kneel and put our heads against the lockers for a few minutes before the siren signaled that we could return to class. Supposedly this was to protect us from being incinerated during a nuclear attack. I realized this was a ridiculous exercise. Along with a few friends, I engaged in my first political act by refusing to participate in a drill early in my senior year. You can imagine that this did not sit well with the school administration. The principal gave us a stern lecture and threatened to punish us severely if we did so again. It was also my first lesson in the power of nonviolence: My high school conducted no more air raid drills that year. At the time, Daniel Ellsberg was working as a consultant to the Pentagon on nuclear strategy. He says little about that work in “Secrets: A Memoir of Vietnam and the Pentagon Papers,” which is among the most inspiring books I’ve ever read about civil disobedience. So, I was anxious to get my hands on his latest book, “The Doomsday Machine: Confessions of a Nuclear Planner,” to read what he has to say about nuclear war. But I had some even more personal reasons for wanting to read Dan’s book. Last August, I was arrested with him and several dozen others at Lawrence Livermore Labs in California, where scientists create new devices to blow up the world. Our demonstration commemorated the 72nd anniversary of the dropping of the atomic bomb on Nagasaki. Coincidentally, my grandson Rocky Barnes-Levering Ly was being born at the very time as we were being carted off to jail. After reading Dan’s book, I knew that I had to give it to Rocky. Hopefully, no country will unleash its nuclear arsenal before he is able to read the book. That’s not a given, particularly considering the current nuclear bomb-waving threats emanating from Washington and Pyongyang. Trump threatened his counterpart in North Korea with “fire and fury the world has never seen before” the same week Rocky was born. Assuming we escape a nuclear nightmare for the next two decades, Dan’s book can help Rocky comprehend the precariousness of our lives in the nuclear age. As a one-time insider and long-time student of nuclear strategy, Dan provides both a helpful overview coupled with lots of historical details. I want Rocky to read “The Doomsday Machine” for yet another reason. I want him to develop an appreciation for why his grandfather has felt it necessary to commit civil disobedience several dozen times over the past half-century. Because I’m in my mid-seventies, I’m acutely aware that I may never be able to explain to Rocky why I tried to block the entrance to a government building the day he was born. 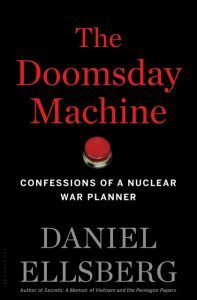 Dan’s book does more than impart historical information and a critique of the entire nuclear madness. “The Doomsday Machine” offers a full-throated call for ordinary citizens to act to avert the catastrophe. I wrote the following letter to Rocky that I inserted in the book along with a newspaper clipping of the civil disobedience action. After reading Dan’s book, Rocky may even find ways of joining the anti-nuclear movement himself. I’m giving you this book in the hopes that you will read it when you are a teenager. In the meantime, I hope that your father and mother — and all their friends — will read it now. The book tells a scary story. It talks about things that most of us would rather not think about. But I think you’ll find the book inspiring. It’s written by a brave man — someone I hope you will consider as a model for your own life. Like many truly brave people, Daniel Ellsberg does not consider himself one. In fact, throughout the book, he tells of many terrible things he did and many mistakes he made while working for the government. It takes courage to admit your errors and even more to try to correct them. He wrote this book in part to make amends for his misdeeds. Dan was a teenager when the United States dropped atomic bombs on Hiroshima and Nagasaki in 1945. He was horrified by the accounts of how tens of thousands of innocent Japanese civilians were incinerated in a matter of minutes and thousands more died in the weeks, months and years that followed. He thought that he could help prevent atomic bombs from being exploded again. So he got a job from the late 1950s to early 1960s working as a high-level consultant to the Pentagon helping to develop our nation’s nuclear strategy. This was the height of what was known as the Cold War between the United States and the Soviet Union (now Russia), which had a communist system of government. Dan considered himself a fervent “cold warrior,” someone who believed strongly that it was his duty as an American to engage in the fight against communism. He had earlier joined the Marines because of his strong beliefs. At the time, both the United States and the Soviets had thousands of nuclear weapons, even though each side only needed approximately 50 to 100 nuclear bombs to annihilate all the cities, towns and people in the other country. Yet both built more and more bombs and missiles as rapidly as they could. Both countries were prepared to launch their weapons on a moment’s notice, and each side had what is called a “doomsday machine” that would automatically respond by unleashing their own nuclear arsenal. While Dan was working for the government, American and Soviet scientists had figured out how to make bombs that were a thousand times more destructive than those that had obliterated Hiroshima and Nagasaki. Called thermonuclear bombs, one of these weapons could destroy everything within a 50-mile radius of the initial blast. That is, wipe out even the largest cities on earth. With hundreds, let alone thousands of these nuclear explosions, the ensuing firestorms would pour millions of tons of smoke and soot into the stratosphere blanketing the earth, blocking most sunlight and lowering temperatures for at least a decade. This “nuclear winter” would eliminate all harvests, starving to death virtually every human being and animal that relies on vegetation to live. I know it sounds crazy that anyone would help develop such weapons. It was — and is — insane. But Dan and everyone he worked with sincerely believed that having the ability to blow up the world made us safe. Hopefully things have changed by the time you read this. This idea, called nuclear deterrence, is still in effect today. It took years, however, for Dan to fully understand the madness of it all. You may find Dan’s description of how he became disillusioned the best part of the book. I thought I knew a lot about our nuclear strategy, but many of Dan’s revelations were news to me — and I would suspect to virtually everyone else who reads the book. Dan shatters the impression that only the president can launch nuclear missiles and bombs. Most people still believe this to be true. This idea has been reinforced over the years by the image of a “nuclear football” — a briefcase with the codes needed to start the war, carried by a military aide who accompanies the president wherever he goes. But Dan discovered that the nuclear football is more public relations than reality. While Dan was working on nuclear strategy for the Pentagon, he went to a movie theater with a colleague to watch a newly released film called “Dr. Strangelove,” which was very popular at the time. It is a satirical black comedy subtitled “How I Learned to Stop Worrying and Love the Bomb.” In the film, a deranged U.S. Air Force general orders a first strike attack on the Soviet Union while the president and his advisors try desperately, and unsuccessfully, to stop a B-52 bomber from delivering its payload, triggering Soviet retaliation and a nuclear holocaust. As he left the theater, Dan and his colleague agreed that the film was not fanciful but “essentially a documentary.” The film’s director had correctly guessed what Dan had learned from interviewing people within the military and top brass at the Pentagon: local commanders could launch nuclear weapons on their own, and there was no way of recalling them. Dan didn’t just work on the theoretical planning and development of the nuclear strategy. He was at the Pentagon during the Cuban Missile Crisis of 1962, and he tells the dramatic, inside story of what happened. I was in college then and was terrified — as was virtually everyone alive at the time. For two weeks, we all went to bed not sure whether we would be cremated in our sleep. When the crisis was over, we thought that rational minds had prevailed, that the leaders on both sides had averted the catastrophe. Dan tells a very different tale. He found out that President Kennedy and his advisors were willing to risk nuclear suicide because of their concern for the next election. They feared that their political opponents would paint them as weak. Even worse, Dan learned that two days after the world believed the crisis was over, the U.S. navy almost provoked a Soviet submarine into firing a nuclear torpedo. Only a last-minute decision by the sub’s captain averted a nuclear holocaust. How did we get to the point where nations are prepared to use weapons that can literally destroy all life on the planet? Dan’s willingness to confront the most difficult moral questions about nuclear war makes his book compelling reading. To answer that question, Dan recounts the dismal history of how nations came to regard cities as legitimate military targets. It started with the use of airplanes during World War I. By the end of World War II, slaughtering innocent civilians had become normalized. Atomic weapons only made the killing process more efficient. As Air Force General Curtis LeMay put it, “we scorched and boiled and baked to death more people in Tokyo … than went up in vapor at Hiroshima and Nagasaki combined.” The moral distinction between killing combatants and noncombatants that had existed for millennia had been swept away. I particularly want you to read the last part of the book because Dan believes it’s not too late for humanity to get out of the precarious predicament it has created for itself. He has a plan for change. First, he hopes that this book will educate people about the problem. It’s only when people know the truth that they have any hope of changing the world. Second, he calls on people within the government who have relevant information to become whistleblowers. That is, if government employees possess data on current estimates about potential casualties from nuclear war, they should share that information with the public. Dan himself was a whistleblower during the Vietnam War. In 1971 he gave newspapers top secret documents called the Pentagon Papers that showed that the government had lied to the American public about the war. He risked spending the rest of his life in prison for his actions, but he did so anyway. Fortunately, Dan did not have to go to jail because of the prosecution’s egregious conduct during the trial. Dan’s actions led to the downfall of one of the worst presidents in our history, Richard Nixon. Dan became a famous person for this action. Recently a major Hollywood studio produced a film called “The Post” that tells about Dan’s bravery in releasing the Pentagon Papers. Finally, Dan hopes that informed citizens will create a movement that will force the government to change its nuclear policy. This, too, may involve some risks. If you look inside the book, you will see a newspaper clipping that shows that Dan practices what he preaches. In the foreground of the accompanying photo, you’ll see Dan lying on the ground. Behind him you can see me (with a big hat) and your grandmother Carolyn. We are trying to dramatize what happened to the victims of the Nagasaki bombing. We’re blocking an entrance to the Lawrence Livermore Lab, where the government conducts research to develop new nuclear bombs. A few minutes after the picture was taken, the police ordered us to leave the area or be arrested. We refused to move. So about three dozen of us were arrested, handcuffed and driven to a holding area where we were photographed and fingerprinted before being released. Just before the demonstration started that morning, your father sent me a text message from the hospital saying that your mother had just gone into labor with you. While we were in the paddy wagon being taken to jail, I told Dan and the others that Rocky, my first grandchild was about to be born. Everyone was, of course, delighted. We all believed that what we were doing was the least we could do to make it possible for you and others of your generation to live long and productive lives without the ominous specter of nuclear war that we have been living with. You are entering a dangerous world. Hopefully you will be able to look back and see that Dan’s book helped put humanity on the right path. It’s not going to be easy. If you look at the last page, you’ll see that Dan quotes another man whom I hope will be inspirational in your life, Martin Luther King Jr.
Robert Levering worked as full-time anti-Vietnam war organizer with such groups as AFSC and the New Mobilization Committee and Peoples Coalition for Peace and Justice. He is currently working on a book entitled "Resistance and the Vietnam War: The Nonviolent Movement that Crippled the Draft, Thwarted the War Effort While Helping Topple Two Presidents" to be published in 2019. He is also working with a team of fellow draft resisters on a documentary to be released in 2018 entitled "The Boys Who Said NO! Draft Resistance and the Vietnam War." Many thanks for sharing this heartfelt personal story interwoven with grisly facts that are hard to take without contextualization like yours. As you know, I’m also a grandpa, and great-grandpa, who is motivated by the young ones to keep working for justice and peace even though I’m long past retirement age. I’m grateful that you bring that commitment and join it to your talents and connections, and also that you still bring your courage into the streets.